Nova Dogsport is a facility dedicated to dog sports and training, located in Harrietsfield, Nova Scotia. With ideal flooring, safe equipment and over 2,500 square feet of working space in a comfortable indoor facility, learning and playing with your dog has never been more fun! 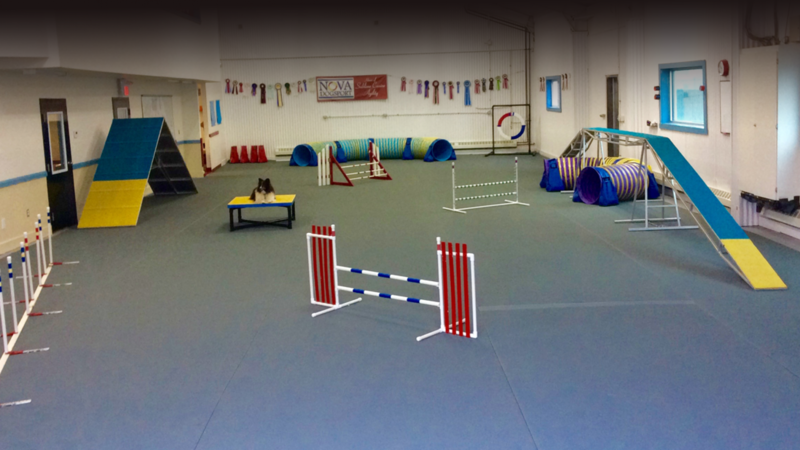 We offer group and private lessons in Agility, Rally Obedience, General Obedience and more. The space can also be rented out by individuals and groups. Growing up, there was never a day Lindsay didn’t share with animals. She spent her free time riding and caring for horses, working at a cat boarding facility, and training her household pets. In 2013 Lindsay apprenticed under Sublime Canine Services, then started teaching their Agility Foundations course. She earned her Operant Conditioning Behaviour Analysis Levels 1 and 2 through Dalhousie University and Cloverfield Behaviour Services. In 2015 she opened Nova Dogsport to accommodate the growing agility and dog sport community within HRM. Lindsay and her family Shelties Quincy and Mocha joined the Sublime Agility group in 2010 and successfully compete in agility, disc dog and previously obedience and conformation. New addition Pinto arrived in 2012 and has already participated in disc dog, agility, and obedience events. Adina MacRae first studied animal learning and behaviour when she earned a Psychology degree at Dalhousie University. After completing her Bachelor of Public Relations at MSVU, she adopted her first dog “Buddy,” a Boxer/Pit Bull mix from the Bide Awhile Shelter (www.bideawhile.org) and got a crash course in dog behaviour. Shortly after Buddy’s adoption, Adina began training dogs and conducting behaviour assessments on behalf of the Metro SPCA. She remains current in her understanding of dog behaviour and has graduated from the Companion Animal Sciences Institute and attended conferences held by the Association of Pet Dog Trainers (APDT) and Canadian Association of Professional Pet Dog Trainers (CAPPDT). She regularly presents at the NSSPCA Animal Wellness Conference and hosts seminars on various dog behaviour and training topics. After becoming involved in Flyball as an outlet for Buddy’s energy, Adina discovered her passion in Canine Agility. She began competing in 2003 and has instructed others with a focus on relationship development and confidence building since then. She has trained eight dogs to competition level including two rescued Chihuahuas, her deaf Border Collie mix and Borzoi. Most recently Adina and her two year old Papillon Dare were selected to represent Canada at the World Agility Open championships in the Netherlands. Adina also enjoys competing in Disc Dog with her Borzoi and has dabbled in Rally Obedience and Conformation. Adina’s other life passion is professional dog walking and she has operated Dogs on the Go, a dog walking and pet care service, since 2003. She currently services the west and south ends of the Halifax Peninsula and Rockingham/Wedgewood area. Jenn Embree began her life working with animals at the age of 13 when she first starting taking riding lessons. She eventually used a co-op course in high school to job shadow local riding instructors and coaches. While still in high school she began working as a stable hand, groom, and lesson assistant at Briarwood Farms, assisting with teaching children ages 8-17 at summer camps for three years. While there she volunteered to ride every problem horse that no one wanted to deal with just to spend more time in the saddle. After university she went on to work as a groom full time, traveling around North America working with many a-circit horse trainers such as Ian Millar, and eventually assistant managing a training barn in Ontario. ​Jenn was first exposed to positive reinforcement training after returning to Nova Scotia with her shepherd mix Naala when she started taking classes to help with her dog’s reactivity. In 2011 she started agility with Sublime Canine with her new rescue dog Mufaasa, and has been hooked ever since. She now competes her with two rescue dogs while continuing to attend seminars and classes from such top trainers as Jenny Damm, Denis Fenzi, and Silvia Trkman, with a strong focus on competitive agility and motivation. Gay Harley, Cert CF has a diverse and extensive background in dog sports and training. She has titled dogs in Agility, Flyball, Herding, Rally-Obedience, and formal Obedience. Her involvement in formal dog sports began in 1999 with her rescue dog Fiver, starting with Flyball and moving quickly into Agility a couple of years afterward. Her achievements in agility includes a National Event Championship, podium finishes at the Agility Nationals, and Regionals Top Pointed Veteran Dog in 2014. She was named assistant Manager for the AAC Canadian Agility Team in 2012 and travelled with the team to the IFCS World Championship that year. Gay has a passion for learning and is always seeking to gather information and mentorship from the best in the sport. She has invested a lot of time ensuring she learns from the top trainers, competitors, and behaviorists such as Jen Pinder, Teresa Rector, Kathy Keats, Jess Martin, Justin Davenport, and Jenny Damm, as well as having online support and video training with Linda Mecklenburg, Denise Fenzi, Julie Flannery, and Daisy Peel. In 2015 Gay completed her Certification in Canine Fitness with the Companion Animal Sciences Institute. She has put her knowledge of canine fitness and movement to good use in her latest dogsport endeavour, Canine Freestyle. She enjoys coaching teams to maximize engagement and motivation, as well as quality of movement for the health and proper gaiting of the canine participants. Gay currently lives with two Border Collies (Kestrel and Rosa) and a Cardigan Corgi (Soleil) in Lower Sackville, NS. An accomplished obedience competitor, first with Shetland Sheepdogs, then with Australian Shepherds, and currently with her Pyrenean Shepherd Fidjit, Jane has successfully competed in local, regional and national trials. Through the years, her dogs have achieved over 40 HITS, Top Dog rankings with the CKC, AKC & ASCA (Australian Shepherd Club of America) and have earned All-Star Top 10 placements in both Obedience and Rally. Jane’s teaching philosophy is to develop attitude and attention in the dog while laying the foundation for accuracy and drive.